After all the delays, cancellations and no-shows the World Cup of Motorsport finally hit the track today – and served up two thrilling races run in dreadful conditions at Zandvoort. Both began under the safety car and neither had a clean finish, with the rain and wind that hit the Dutch seaside track catching out even the most experienced drivers and causing multiple accidents. Two late crashes in the sprint race led to it being red flagged, while another set of incidents towards the end of the feature race brought out a safety car that peeled off at the last gasp, leaving a 100 meter dash to the line for the seven cars still running. The same three nations occupied the podium in both races. Malaysia’s Fairuz Fauzy led home New Zealand’s impressive teenager Earl Bamber and veteran Frenchman Loic Duval in the sprint while France took the honours in the feature, ahead of Malaysia and the Kiwis. The biggest name to fall victim to the weather was Team Ireland, driver Adam Carroll completing barely five laps of the two races. “Very disappointing for the team and I can’t believe we came away with nothing,” he said. Home favourite Jeroen Bleekemolen took a fourth and a fifth place. By contrast, the high rate of attrition in the second race allowed some unlikely teams to score. Lebanon took their first points in four years of trying despite failing to finish the race, after being classified eighth, and debutantes South Korea and Monaco were both lapped but finished sixth and seventh to open their accounts. While driver errors claimed many cars, very few teams suffered mechanical problems with their brand-new Ferrari-inspired and powered race cars which, for the most part, performed admirably. In the sprint race Ireland’s Carroll was the first victim of the weather, crashing out with the opening safety car barely gone. He lined up for an ambitious plunge past leaders Netherlands and New Zealand in anticipation of the green flag, span, and was hit by Monaco as he came to a halt, ending both nations’ races. Worsening conditions during the course of the race meant that different cars found their set-ups working for them at different points in the contest. 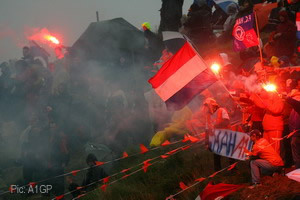 The Dutch began strongest, but struggled as the circuit grew wetter and could not hold off the Kiwis. Later, Malaysia, France and China began to move through the field, Fauzy fulfilling the promise of his Donington Park lap record by taking the victory. France gained 11 places on their qualifying position to finish third behind New Zealand, but China’s GP2 pilot Ho Pin Tung crashed out, as did Brazil – and the two wrecked cars prompted officials to red flag the race. The result was calculated from the positions at the end of the 10th lap, meaning that behind the podium finishers the Dutch finished fourth, ahead of Switzerland and South Africa. Italy and the USA completed the points-scorers. 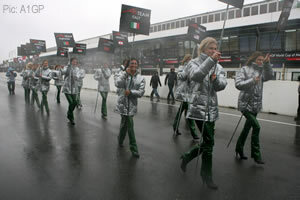 Even the grid girls suffered in the weather. Poor loves. The feature race grid was arranged according to finishing positions in the sprint, and winners Malaysia were able to build a lead in the clean, spray-free air out front. But their decision to pit as soon the first mandatory pitstop window opened, combined with a wheel nut problem, let France through into a lead they would take to the flag. Both Malaysia and New Zealand ran relatively trouble-free races behind Duval, but further back there was chaos, with a number of spectacular accidents as drivers were caught out by standing water. Defending champions Switzerland were beaten by one of the day’s few mechanical problems, while the Dutch challenge also faltered in the face of gear selection troubles. Going into the next races, to be held in China on November 9th, Malaysia and France each have 22 points, the French fastest lap in the first race providing an extra point to make up for their slightly worse race results. New Zealand have 18 and the Netherlands 11. The Chengdu races should see the return of the teams unable to compete in the Netherlands because of delays in the supply of the new cars. Team GBR are among those affected, along with Pakistan whose Yorkshire-born driver Adam Khan was unable to fit safely in the chassis. New rules mean that teams will be able to drop one weekend’s result from their end-of-season points total, so neither team will suffer unduly from their rivals’ successes this weekend, and Adam Carroll’s Irish team can also recover. Categorised under A1GP, tagged under A1GP, Adam Carroll, Charlie Kimball, Earl Bamber, Fairuz Fauzy.